Infrastructure: What Do Candidates' Plans Mean for Construction Labor? Home | Ferrous Metals | Infrastructure: What Do Candidates’ Plans Mean for Construction Labor? Infrastructure: What Do Candidates’ Plans Mean for Construction Labor? This election season, infrastructure investment has become the belle of the ball, putting blighted manufacturing towns such as Monessen, Pa. and Granite City, Ill., not only on the map, but they’ve become the go-to backdrop for both candidates as they criss-cross the nation trying to win votes. But what do candidates Hillary Clinton and Donald Trump’s plans really mean for the roads, bridges and infrastructure that everyone agrees need to be repaired? Can they even be successfully executed? 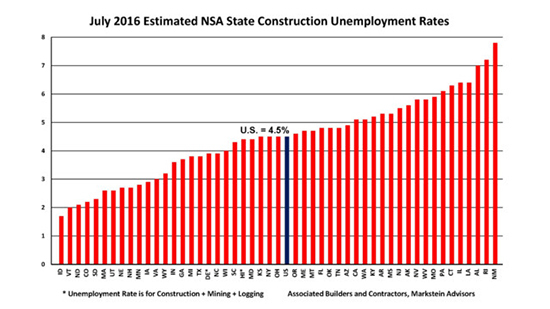 Construction unemployment rates in all states and the U.S., overall. Source: Associated Builders and Contractors of America, Markstein Advisors. Politico reports that Clinton has proposed a five-year, $275 billion plan. Trump suggested he would double her proposal. Clinton’s website touts a White House report that every $1 billion in infrastructure spending creates 13,000 jobs. Only one problem: That report is from 2011 when the construction industry was in the midst of one of its worst economic years in its history. Five years later, there’s actually a shortage of skilled construction laborers as construction has enjoyed robust growth every year since. Although spending has recently declined both home construction and nonresidential have posted strong gains this year. So, the argument that infrastructure investment is needed as economic stimulus doesn’t hold much water anymore. U.S. growth has chugged along at a positive if unspectacular rate and unemployment, overall, is down to 4.9%. Construction unemployment is even better, hitting its lowest point in 16 years this week. With all of these construction workers gainfully employed, mostly by the private sector, who will work on these roads and bridges? Increasing construction wages are usually a good thing for the economy — higher wages also means higher costs for the government and Congress’ prerogative is usually of the ‘what’s a few billion more?’ persuasion for infrastructure bills in the first place — but I’m not sure that even that could fill the void such a huge federal commitment would require. Remember, the average skilled laborer is now in his ’50s and retirements and attrition have led to a skills gap that would require an education and training effort unseen since World War II, especially if Trump’s $550 billion plan is passed intact by a republican congress. He might not even need a like-minded congress, as democrats are more generous with infrastructure as stimulus than Trump’s own party, anyway. Who Would Really Build the Wall? The Trump plan would also seem to run, headlong, into another of Trump’s signature issues: immigration. While there is some logic to the Trump campaign’s plan to tax wire transfers from U.S.-based workers to Mexico to pay for a border wall — the Mexican government has long-encouraged Mexican nationals working legally or illegally in the U.S. to send remittances home to local municipalities, and what’s good for the goose has to be good for the gander, right? — the more pressing problem, though, is who would build it? Would a theoretical Trump administration have to turn to an immigrant labor force to build a wall to essentially keep itself out? If the wall is essentially tall fencing, which already exists along some of the southern border, then it may not require a whole lot of skilled labor, but that’s not what Trump’s been selling on the campaign trail. What about the parts of the border that are under the Rio Grande? You’re talking major aquatic engineering there. The winner, it would seem, is going to be congress which gets to collect and, somehow, appropriate the vast sums that will pay for the next President’s U.S.-based nation-building ambitions. The boodle and ever-escalating construction costs of whatever is planned — with money for retraining, a possibly Mike Rowe-promoted federal vocational education program, and lawyers to pave the way in nearly U.S. jurisdiction — will easily double the costs of anything on paper today. And that’s WITHOUT attorneys hired to defend a potential Trump remittance seizure program. It’s a good time to be in infrastructure.